Community Art Sunday is back! 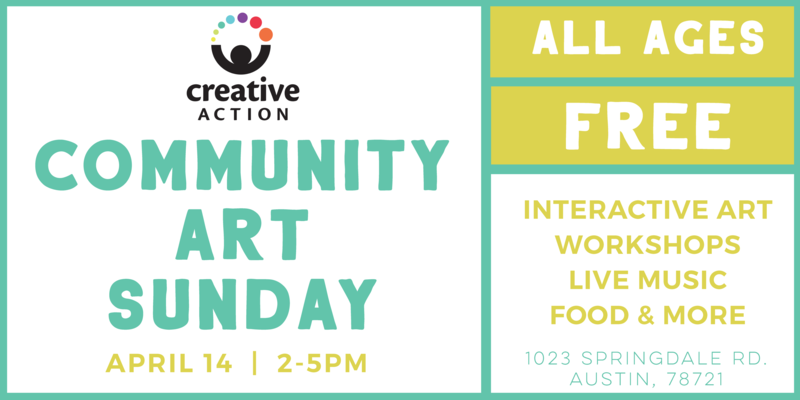 Join us for Community Art Sunday on Sunday, April 14 at our NEW center at Springdale General in East Austin! Our new home includes a visual arts studio, a digital media lab, more square footage, and is in a complex built with the arts in mind. In addition to getting the first peek of our bright and vibrant new space, you’ll enjoy interactive art experiences, arts workshops, young artist performances, live music, film screenings, food and drink (free and for purchase), and more! Come celebrate the transformative power of the arts with a fun and FREE community event for ALL AGES! We can’t wait to welcome the you into our new home and celebrate youth as artists and leaders in our community.